Frazzled enough for ya? Or are you sitting smug because you are done with your cards, decorating, baking, house-cleaning, shopping, wrapping, lunches, parties, and visiting? I belong in the former group, but I think if you're done, then you have every right to be smug! We'll resist being haters considering we're supposed to be filled with the spirit of Christmas. Cough. 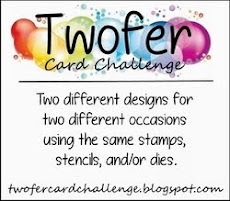 Today's card features white embossing for the current Take It, Make It: December challenge at Craft Stamper. The large background stamp is Hero Arts (S1523) "Flower Lace Pattern," which I heat embossed in Hero Arts Detail White embossing powder. Because to me the little flowers look like poinsettias and holly leaves, I colored them Christmas red and green using my SU markers. The centers were colored with a gold At You Spica pen. The banner was created using a NBUS scalloped die by Papertrey Ink. I cut it down to shorten it and scalloped it across the top using a very old pair of decorative scissors. (Remember those?!) The sediment itself is a sticker. The kraft paper is by Papertrey Ink and the red is real red is by SU. 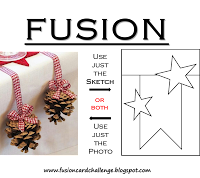 The current Take It, Make It: December challenge at Craft Stamper will run until December 27, 2014. 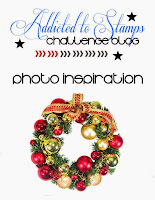 I'm also entering the current challenge at Addicted to Stamps and More, where the challenge is a photo inspiration. I was inspired by the Christmas colors. And the current Fusion Card Challenge, where the sketch was inspirational. Please click on the links for more information on sponsors, prizes, and rules. I hope you can join in the fun! Donna Hitz of Frozen Stamper. 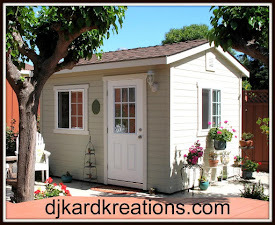 Donna has been blogging since February 2010, so there is a ton of inspiration on her beautiful blog for you. Her banner name comes from the fact that she and her husband live in Alaska. She is an award-winner, instructor, and designer whose designs have been printed on coffee mugs and pajamas! Vanessa B. of Vanessa's Paper Creations. Vanessa has been blogging since January 2012, so she's coming up on her third blogaversary! Vanessa is an award-winner and current and past member of design teams. Her cards are clean and crisp and happy and I know you'll be glad you visited her! Tina of Tina's Handmade Creations. Tina has been blogging since 2009! Another wonderful card artist with years of inspiration for you, Tina is also an award winner and a designer. Her cards are impeccably made and totally fun! AJ Bodine of Rutabaga Pie Designs. A resident of North Carolina, AJ has only been blogging since October of this year! Please take a few minutes of your very busy day to stop in and give AJ a warm welcome to our crafting community! She is uplifting and enthusiastic and I know you'll enjoy your visit! Speaking of followers, a few of you have asked if there will be another NBUS Challenge in January. Even though I may not reach my next follower milestone by the first of the year, I'm pretty close, so I will go ahead and host another challenge! If you've been good little crafters, I'm sure Santa will bring you NBUS goodies that you'll want to show off! Or, if you're like me, you'll still have NBUS from prior Christmases that you'll want to show off! I look forward to seeing your creations! Fabulous banner card and super background embossing & colouring too. Your card is gorgeous, Darnell! Love the colored-in white embossing on your background! This is gorgeous Darnell, the embossed background is stunning and I love the festive colours. I am definitely part of the frazzled group this year, never mind I'll get there in the end! What a gorgeous creation, Darnell. Red and green look marvellous against a kraft-coloured base. Darnell I love that beautiful background on your pretty card. You hsve inspired me to remember how lovely white embossing looks on kraft card. I'm still chasing my tail! Lovely card Darnell! Definitely getting frazzled now! Cakes still to decorate and presents to wrap - not as easy to do with my two new fur babies helping! Merry Sunday to you too - I'm just waiting for two crafting buddies to show at mine ..... long wait, they're not due for 5 hours!!!! WOW! that background looks amazing Darnell! I love your card the background is so pretty. Hope you have a wonderful Christmas full of love and blessings. Hope your preparations go to plan. I love such combinations - recycled paper and white embossing. Beautiful holly theme you used to decorate the background. Beautiful card. This is really lovely, Darnell! I love that HA background stamp. It does look like poinsettias and holly leaves doesn't it? Well, I am not one of those smug people all ready for Christmas, that's for sure! My son is all bought for but I've gotten nothing for my husband yet. I haven't done any baking yet either. I only just got my tree up yesterday! Oh well, it'll all be fine. :-). Hugs! Beautiful card, Darnell! I'm completely unprepared for Christmas and feeling the pressure. I have another week of work and then I'm right into the Christmas visiting, and I don't have the presents and food organised yet, eek! Since you are going to have another NBUS challenge, I'd better save some of my recent NBUS, since I'm pretty sure Santa isn't bringing me any, lol! This is lovely!! And I'm definitely not sitting smugly ... Why do the days go so fast when there is so much to do?? The list is still very long for Christmas...but we're making progress! Love your beautiful card...the coloring is fabulous Darnell. Love the coloring, it does totally look like a holiday background! Wonderful card, Darnell. It's so very festive. I remember those fancy scissors and still have some. Although if I tried to use them, my hands might cramp. :) Have a happy Sunday! This is so beautiful, Darnell! Love that beautiful white embossing against the kraft card stock, and I love how you colored in the little flowers and leaves. So pretty! Hand up for the 'frazzled' category! Cards for my family and my husband's, gifts for the kiddos, figuring out our travel schedule (my family next weekend - I hope - home for a day, then off to my husband's). Yes, frazzled AND frantic; I won't even discuss the craziness of work. Anyway, your card has cheered my mood immensely...festive and fabulous! Gorgeous card, Darnell! Love the background and beautiful banner! I really haven't done much baking, just some cookies for the GDs to decorate. Maybe I'll do a little next week. Your card is a stunner!!! I really, really like the color combo and the background stamp is perfect! Er. I, too, am of the former group and sneeringly envious of those that aren't. Still cleaning out the sugar, flour, butter mess in the kitchen... though, still making some modicum of progress. In any case. LOVE the way you've colored that background stamp...gorgeousness and a real winner. My man & I don't exchange gifts and the offspring haven't figured out that I love NBUS, so I'll be rifling through the items I've obtained throughout the year (& some new arrivals) in 2015. Hope you & your's are having a stellar holiday. Oh heck, you mean I should be getting my shopping done? I haven't recovered from my card making yet...lol. Your card is so sweetly colored, and sets off your sentiment beautifully. Have a wonderful Christmas. 1 out of 9...that's it for me! Smug is a looooong way off! Nothing that a few 3:00am's won't fix though! The scissors....OMG - I'd forgotten all about the 7,000 pairs that are in a box in the far corner of the closet! I am curious if you were able to stamp only once the background stamp cause it is mighty large. Love the card white embossing, did cuts and Kraft paper all faves . Have a holly jolly! Your card is just beautiful and festive! Just love Kraft and white embossing! And WAHOOOOO! Another NBUS challenge. Love that card - and I definitely agree the background looks like holly and poinsettias! It works so well embossed in white on kraft. Very glad to hear there will be another NBUS challenge - I have a lot of NBUS!!! What a way with words! "Cough" got me this time, ended up laughing heartily. Thanks for the cheer-up - needed it because here I sit making sure I don't miss any of your entries and my cards aren't done, the tree's not up. Thank God I won't have company so there is no baking to do! Beautiful card, Darnell! I'm doing pretty good as far as Christmas details go. I've sent my 2 boys their gifts, so that's HUGE! Thanks for the link to Addicted To Stamping. I joined in! Dear Darnell, I'm admiring your exact stamping of background on your card. It is amazing work! I love your background. Embossed in white and colored with the Christmas colors sure does make it look like poinsettias and holly. Fantastic design! I love those little colored in flowers, Darnell. I never get frazzled but I'm not quite done either. Cards, done. No tree up yet. Presents ordered, Wrapping to do. Christmas will be different this year with my parents in the care facility. Gorgeous background & I love how you used that sentiment sticker, Darnell! Great card! I always enjoy reading your posts. I'm sort of there with regards to Christmas! I think your card is stunning. I love the background stamp and the pretty tag - great work. Thanks so much for playing along with ASM this week! These flowers look like Christmas poinsettias to me also. Like what you did with this big background stamp. It's really pretty with that nifty banner treatment. I still use my decorative scissors occasionally too. Will definitely check out the new follower from NC. She's in my neck of the woods! Merry Christmas, TFS & BIg, Big hugs coming your way. Now I'm dropping to the older post to see these trees, cause I have that die (?NBUS? I can't remember) LOL. What a beautiful card you created! I always forget how pretty white embossing looks on a card. Add me to the Frazzles group! Even when you think you're done with Christmas prep, each day someone needs one more this or that. On the first day of Christmas my husband said to me, "I need cookies for the office party!" On the second day of Christmas my daughter said to me, "2 school gift exchanges, and cookies for the office party..." Your card is a beauty! 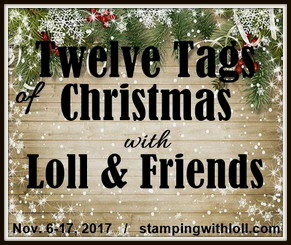 That beautiful background stamp is perfect for holly and Christmas flowers - Sweet! Nope I'm not done, but I'm close!! Your card is so very pretty Darnell and gave me a smile!! Unfortunately, I'm not even close to being ready, but somehow it always comes together, right? Thanks so much for playing along with us again at ATSM...we always love to see your creations in the gallery! Your card is beautiful! Thank you for entering it to the Take It, Make It challenge, where I've got the privilege of being the sponsor this month! It's fun to look at all the entries and "meet" new people :-) Good luck! Frazzled!!!?? I'm getting there ..... still got presents to buy never mind wrap, and the cooking, well I'm dreading starting that!! The embossing on the craft is beautiful ! Great Christmas feeling on your card ! Wishing you and your family a great Christmas time and a creative 2015. Love that large stamp Darnell and I think they look like holly leaves and poinsettias too! Not quite in the smugzone but all 3 trees are now up and a smattering of cards up also. Still got to wrap up the parcels, make mince pies, finish table runner etc etc!!!! LOVE your heat embossed and colored background! What a great stamp and love how you've used it! Well, to be totally honest, I am NOT in the Christmas spirit ...yet...Even with that sweet GB of mine...I'm still waiting lol! I LOVE that BG stamp and your embossing, great card! Love this background stamp and how you've colored it! I hadn't seen the scalloped banner before and I love that too! A very merry, merry card! We received your beautiful Christmas card yesterday and are enjoying it. Thank you. It's so fun to get happy mail! Wow! This is gorgeous and you colored in the flowers,I thought it was patterned paper ,u til I read. Beautiful CAS beauty. Darnell! This is sooooo beautiful Darnell, I really love everything about it. 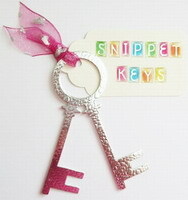 Especially the banners, I need to get me some banner dies, they're so useful. I really hope to pop in again before Christmas but if I don't I hope you and your lovely family have a wonderful Christmas. Lovely white stamping on such a festive card! Thanks for joining us at the Take It Make It Challenge. Your cards are always a bright inspiration!! Gorgeous bright cheery card, just like Christmas, bright and cheery! SO pretty Darnell! Beautiful coloring on your white embossed background! thank you so much for taking the time to join in the Fusion Challenge! I look forward to your next NBUS challenge too! such a very pretty card!! LOVE!!! Thanks for playing at ATSM!! FABULOUS FUSION Darnell - so glad you joined in the fun!!! Frazzled? Yup! The card is fabulous, beautiful white stamping and very pretty design Darnell. Beautiful card Darnell...I love that pretty stamp and you used scissors??? so fun to pull out those older goodies that we all have. So excited to hear you are doing another NBUS challenge, I have plenty to use for your challenge without making another purchase. Can't wait. The embossed BG and colors on the kraft, ur card is such a beauty! Thank you for sharing with Fusion! Just saw your comment on my blog about the HM on Fusion so popped over there to check it out and see that you got an HM too! Well done! This is such a beautiful card - and I can't imagine the work in coloring all those little flowers and leaves. Happy Holidays! Congrats on your HM at Fusion! Beautiful card, love the cool crisp feel! Just catching up with myself, with commenting, and with life in general! I've got that stamp and never really thought of it as holly/poinsettia/Christmassy, but seeing it coloured like that, well, it's obvious! Fab job, Darnell, and I love that sediment. Thanks for playing along at TIMI, and Happy New Year! So stylish and stunning! Fabulous card! Thank you for joining the Take It Make It challenge!